How does Loft style look? "Large industrial halls transformed into apartments." This style exhibits purist furnished rooms and furniture with clean lines and simple designs. Additionally, only pieces of furniture without much decoration are selected. Reduction can be used in this style as a special stylistic character - often a room seems more luxurious when a piece of furniture is removed, than when one is added. Thus, this style is airy and light. Today, in many metropolitan areas and large cities, existing buildings and living spaces are continually adapted and reinterpreted. Originally, the term loft originates from the designation for the expansion of attics. 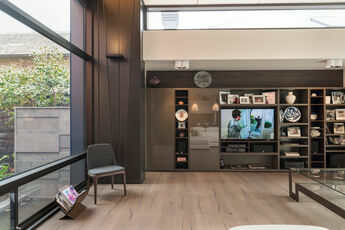 A loft mainly contains timeless furniture pieces manufactured to a very high quality. In such large industrial halls, it is important that the furniture is sturdy but also cheerful. The pieces of furniture are all real eye-catchers and mostly design classics. Furthermore, a fireplace with wood stacked next to it is almost compulsory in a Loft apartment. The walls are additionally equipped with large-format images. Large halls and living rooms, which are mostly surrounded by concrete walls and lots of metal, can be optimally combined with the soft tones of natural wood. Such materials need a kind of counterpart to make this industrial real estate liveable. The basis for this is nearly always wood. The aesthetic between nature and industrial materials exudes a very special charm. 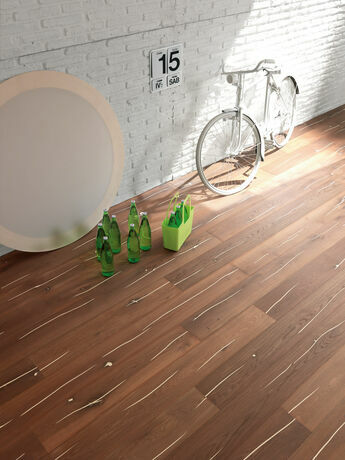 mafi natural wood floors from the DOMINO, CARVING, MAGIC, CORAL, BASIC OAK and TIMELESS collections are unique building blocks for your Loft style apartment. 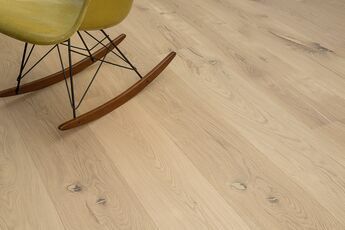 The colour palette ranges from grey oiled surfaces, to thermo treated woods and also light Oak planks.